Many school classrooms have an animal, whether it’s a fish, rabbit or guinea pig. A new study in Australia by Marguerite O’Haire (University of Queensland) et al investigates whether an eight-week program involving a guinea pig in class leads to improved social skills and a reduction in problem behaviours. Schools that wanted to take part in the project were divided into two groups, one that received the program and one that was wait-listed. This meant the two groups could be compared. The children were aged between 4 and 12 years old. Teachers and parents completed questionnaires about children at the start and end of the program. Eighty-two guinea pigs took part in the study. Guinea pigs were chosen because they are friendly, easy to look after, and would likely be happy in the school environment. Each classroom received two guinea pigs, because they are social creatures and need the company of a conspecific. The researchers chose classrooms that included children with Autism Spectrum Disorder. 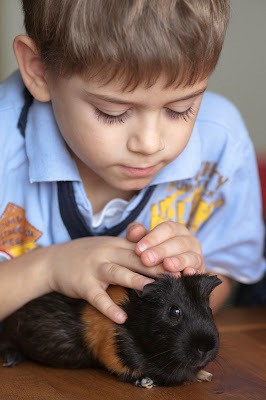 In the Animal Activity schools, children were put into a group of three – two typically-developing children and one with Autism Spectrum Disorder – and given responsibility for looking after the guinea pig for eight weeks. The program facilitator taught the whole class about guinea pig care, and then visited the school twice a week to spend twenty minutes with each trio of children. Activities included preparing food, cleaning the cage, weighing and brushing the guinea pig, and providing enrichment by building mazes and making toys. They also read fiction and nonfiction about guinea pigs and drew pictures or took photographs of them. At weekends, a child took the guinea pig home to care for it with their family. The authors acknowledge the possibility that the animal itself was not the cause of children’s improved scores. In fact there are several differences between the two groups of children. It could be that the small-group activities with an adult were responsible, and/or that spending time with a peer with Autism Spectrum Disorder was beneficial for their social skills. Of course, the raters knew whether or not children had taken part in the guinea pig activity, but there was no difference in ratings between the classes where the teacher decided to keep the guinea pig compared to when they did not. Future studies could use an independent assessor who was blind to the experimental condition. In a separate paper, the scientists report the effects for children with Autism Spectrum Disorder. These children also improved in social skills and social approach, and showed less social withdrawal, if they were in the Animal Activity group compared to the wait-listed group. In addition, parents said their children were more interested in attending school if they were in the Animal Activity program. This is an important finding because children with ASD can find the classroom a difficult and isolating place. The activities the children engaged in with the guinea pig sound like a lot of fun. Although they were not directly asked for their opinion, it seems likely that the children enjoyed the program very much. Although further research is needed, these studies suggest that animal activities in the classroom may be beneficial for typically-developing children as well as those with special needs. At the end of the program, the guinea pigs were all adopted, either by the family of one of the children who had taken part, or by the teacher who wanted to keep the animal in the classroom. Do you like the idea of animals in the school classroom? Pretty cool. I totally support this.